$18 Million Violin Looking For A Home While Stradivarius might be the closest thing to a household name when it comes to valuable violins, an instrument made instead by Guarneri del Gesu may be the most coveted instrument ever. If it sells for its asking price of $18 million, it will be the most expensive instrument on Earth. 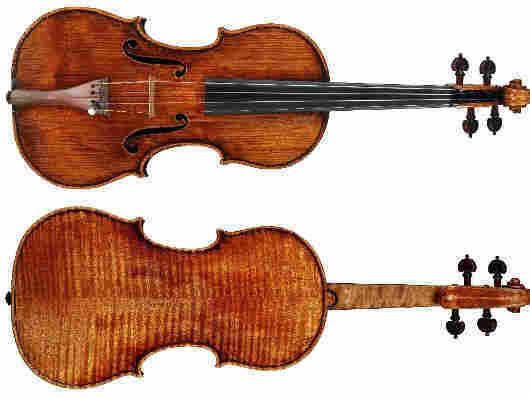 A rare violin is up for sale, with an unprecedented price tag of $18 million. If it goes for its asking price, the violin will be the most expensive instrument on Earth. One might assume it's a Stradivarius, the closest thing to a household name when it comes to valuable violins, but it's not. Though Stradivari's reputation is more widespread, many violinists prefer the sound of violin maker Giuseppe Guarneri, known as "del Gesu." The violins of Guarneri, a late contemporary of Stradivari, were only popularized in the 19th century, by the great virtuoso Niccolo Paganini. Violin maker Sam Zymuntowicz services instruments for players and builds violins himself. "Guarneris tend to be very robust violins," he says. "They're thick in wood, massive in sound." This particular Guarneri is known as the "Vieuxtemps," after its most famous owner, the soloist and composer Henri Vieuxtemps. Zygmuntowicz says it's common for instruments to pick up the names of their owners and players. "It's a way of differentiating the violins," he says, "and it's certainly a useful sales tool." Zygmuntowicz says there's a definite difference between Guarneris and Stradivaris. "Generally speaking, Guarneris are very full on the low end," he says. "Stradivaris are characterized by a lot of high-frequency response, and a little less in the low frequencies. People use different words for Stradivaris on the upper end: 'twinkle,' 'sizzle.' Guarneris, by contrast, tend to be very thick, massive, and full." Violinist Aaron Boyd says the Guarneri simply has more power than the Strad. "The Guarneri has the kind of punch that a lot of fiddle players really gravitate towards," Boyd says. "They know that when they play this fiddle, it's going to soar to the back of the hall." The Vieuxtemps has been dubbed the Mona Lisa of violins. There's a reason it's the most expensive instrument on the market -- its health has been very carefully maintained over the centuries. "The Vieuxtemps is very well-preserved," Zymuntowicz says. "No cracks, no internal patches. It's very much as it left the makers' hands. What makes the Vieuxtemps different from other Guarneris is that because it's so healthy, it has more brilliance and more presence." Despite the record-breaking price tag, the sale of the Vieuxtemps is unlikely to affect the violin market as a whole. Most violinists have no hope of actually owning a violin of that caliber. Even a moderately or low-priced Guarneri or Stradivari is out of their budget. "Musicians are like jockeys now," Zygmuntowicz says. "They get to ride the thoroughbreds that are owned by people who can afford to buy them."